1. In slow cooker mix onion, garlic, chicken, lemon pepper, oregano and allspice; mix to coat chicken with seasoning. 2. Cover; cook on LOW for 4-6 hours. 3. Remove chicken from slow cooker; place on cutting board. Shred chicken with 2 forks. Salt and pepper to taste. 4. To serve, stir yogurt into onion mixture in slow cooker. 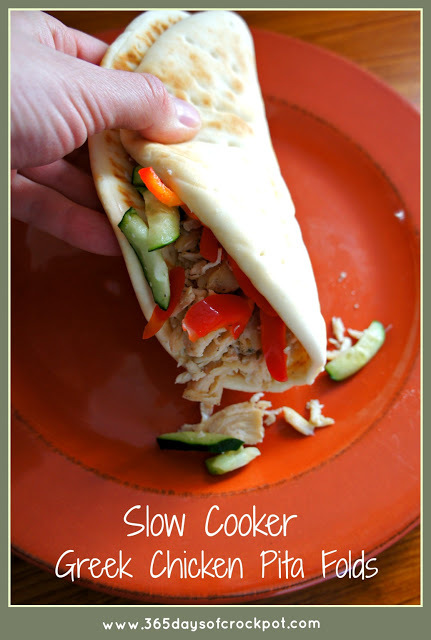 Spoon chicken onto warm pita breads. With slotted spoon, transfer onion mixture onto chicken; top with tomato, cucumber and peppers. I LOVED this recipe! It was delish. I loved the flavor of the yogurt sauce. It reminded me of gyros…except with chicken instead of lamb. This is a great summer recipe. I tried to make homemade pita pockets for the first time and I’m sorry to say they didn’t turn out. They were too thick and the pocket didn’t really form. So I won’t be posting that recipe. Anyone have tips for making pitas? I give this 4 1/2 stars and will be definitely making it again. This was a good dish. I liked the flavor of the sauce and chicken. It smelled very good when it was cooking. Ohh, I’m definitely making this one. The recipe I have used for pitas says your oven temp should be at least 525 degrees. My oven doesn’t get that hot…500 is tops. I don’t know how you made your dough but here’s my suggestion: the dough should not be too stiff, each loaf ball must be given time to rise (about an hour) then roll out…gently, then bake. Good luck….oh yeah, those that don’t puff (and even the ones that do) make great personal pizza crusts! YUM! Hi, I was just wondering where you get all the recipes you post. Do you make them up, or do you find them from other places? If you don’t make them up, could you post where the source recipe is coming from? It would be nice to know where to go look for more of the types of recipes you’re making. Thanks!